An uptrend occurs when a stock makes consecutive higher highs and higher lows, resulting in a price advance which trends higher. Each relative high is above the preceding high, and each relative low is higher than the preceding low. 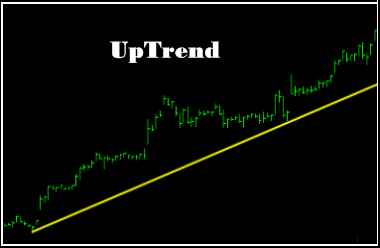 Uptrend lines gain more validity each time price touches but does not penetrate the uptrend line. An uptrend remains a trend until this series of higher highs and higher lows is broken. A downside penetration of a rising trend line is a technical sell signal, and usually the first indication that an uptrend may soon end. An uptrend is deemed to be complete with the formation of a lower high or a lower low. 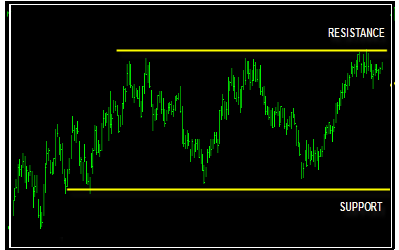 A channeling stock is a stock in a trading range with prices bound by two parallel trend lines. The parallel trend lines connect the highs and lows, which form the area in which the stock is channeling. The upper trend line acts as resistance, and the lower trend line acts as support. Channeling stocks and trading ranges are the typical price action in stocks, as stocks tend to trend less than half of the time. A stock which breaks out of a channel or trading range is often affected by the duration of the channel, the width of the channel, and the strength of the breakout. Trading a channeling stock may mean buying support and selling resistance while waiting for a breakout to occur and a larger move to trade. Appearance: A channeling stock has limited movement and is bound by well-defined trading range. There is resistance above the stock and support below. Sellers lurk at resistance, preventing the stock from making new relative highs by selling at higher prices. Buyers lurk at support, preventing the stock from trending lower or making new relative lows by buying at lower prices. This leaves the stock with horizontal price action rather than an uptrend or downtrend. The trading range may be wide or narrow, and is typically only resolved with a high-volume thrust to new relative highs or lows. Channeling stocks offer a variety of trading possibilities. Some traders will buy the stock at support with a stop-loss placed below support, anticipating a move back up to the top of the channel. Other traders will short sell the stock as it reaches the high end of the channel in anticipation of a move back down toward support, where they expect to cover the short for a profit. Finally, breakout traders will wait patiently for the stock to break out of the channel entirely before initiating a trade, expecting the stock to resume its prior trend. 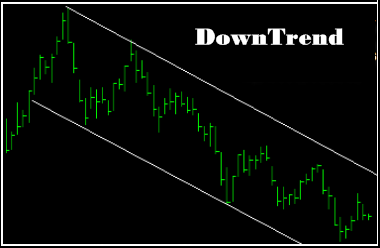 The price projection for a stock breaking out of a channel is dependent upon the characteristics of the channel as well as the intensity of the breakout.